You’ve probably heard that over half of Americans don’t have $1,000 in savings. That’s truly scary because life throws all sorts of financial curve balls at us all the time. If you ever, ever, ever, ever (ever, ever) want to be financially independent, step one is to build a rainy-day fund. This is your safety net Don’t even think of investing in stocks or bonds or mutual funds or your friend’s amazing, can’t-lose business plan until you have a rainy-day fund firmly in place. How much should be in your rainy-day fund? The experts say it should be six months’ worth of your living expenses. If you’re living paycheck to paycheck or paying off debt, then start with a smaller goal. Put $50 away each month and try to make it $100 a month as soon as you get a raise at work. Our point is – just start saving. A big surprise expense is going to drop on you in the future. It may not be tomorrow or next week or next month, but none of us are immune. Car Repair – You’re driving down the highway, singing your heart out to Katy Perry’s latest hit, when suddenly your car starts to rattle. You manage to pull it onto the side of the road just as smoke begins curling from beneath your hood. The average car repair is $500 to $600. If you don’t have that money, how are you going to get to work? Hours Cut at Work – Your office just lost a big client, or sales are down. Your boss needs to cut your hours but promises it won’t be permanent. That isn’t exactly reassuring. How are you supposed to pay the mortgage or the rent on half your income? Job Loss – What’s worse than having your hours cut? How about losing your job altogether? Overnight, you’ve just lost all your income. Somehow you doubt your landlord will let you skip your rent payment until you get a new job. House Problems – Your fridge has been on its last legs for some time now and finally gives up the ghost. Even a modest fridge is going to set you back $500. You don’t want to have to survive on ramen for the rest of your life, so are you going to have to put it on your credit card? Health Emergency – The oncologist has reviewed all of your test results, and she has good news. It isn’t cancer. You’re so relieved, but all that testing added up. Your deductible is $3,000. Where is that money going to come from? Loss of a Family Member – You mom passed away, and though she left behind a lot of amazing memories and wisdom, she was never a good saver. You and your siblings all pitch in to cover the funeral expenses, and you take the week off work, unpaid, to give yourself time to emotionally heal. Surprise Trip – Your father fell down the stairs and broke his hip. You volunteer to take care of him for a week as he recovers. Fortunately, you have enough vacation time saved up, but you still have to pay $500 for the round trip flight, since he lives on the other side of the country. Ticket or Fine – You were hardly speeding at all, but the police officer must have a quota. Suddenly, you’re holding a $200 ticket in your hand. Can you brush it off as bad karma, or are you suddenly worried about whether you can pay the ticket and make your rent? Family Member or Friend in Need – Your sister calls. Her youngest needs braces, but she doesn’t have the money. Do you have a thousand dollars that she can borrow? She’ll pay you back as soon as she can! What are you going to do? You can’t let your niece get teased for her crooked teeth! Everything Else – There is literally no end to the surprise expenses you can face. You might drop your phone in the sink tomorrow. Your dog could get sick. Maybe you’re ready to find a new job but need to purchase clothes for the interviews. A rainy-day fund gives you freedom. Now, a speeding ticket won’t mean having your phone service disconnected. You won’t fear losing your house if your hours are cut. You can afford the medications you need to be your best self. Building a rainy-day fund is an investment in yourself, and you deserve it! Want to learn more about how to create a rainy-day fund and achieve financial stability? Consider starting a Money Club. 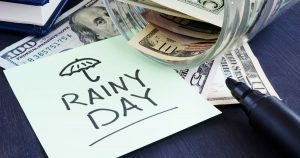 The post These Ten Reasons Are Exactly Why You Need a Rainy-Day Fund appeared first on WIFE.org.